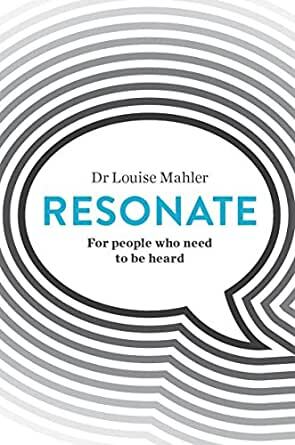 In Resonate Dr Louise Mahler, voice coach extraordinaire, demonstrates that your mind, body and voice are inextricably linked. By approaching voice through an understanding of the whole body, Louise explains how your state of mind determines the way you hold your body, how your feelings resonate through your voice and how this sequence ultimately influences the efficacy of your communication. She explains the most common ways people react to nerves or excitement, as well as how your listeners respond to your voice and gestures - and how to use these to communicate more powerfully. Whether you struggle to make a point at work or a school committee meeting; whether you're going for the next big job or trying to improve your performance in the one you have; or you simply want better ways to communicate, Resonate will show you how to tune in to your own vocal intelligence, identify the physical and mental blocks that are holding you back, and reclaim your authentic voice. With its practical exercises, inspiring real-life stories and insightful tips, this book will unlock your confidence and show you how to make your message resonate. 5.0 out of 5 starsLet's do this! I am constantly on the look out for improving my performance, but do not have the time to wade through heavy, technical reading. I was thrilled to find a book which was not only informative, humorous and anecdotal, but had me jumping out of my chair, checking out the exercises. Guess what, they really worked and I understood why. I now have a new awareness and thanks to the tips in this book, I can do something to change old habits and move on to a more effective, magnetic presentation. Dr Mahler has a wonderful conversational style which immediately puts the reader at ease and into "Let's do this" mode. A must read! A bit of a mixed bag of voice, gesture and personal anecdotes. The author makes an attempt to educate us about the relationship between mind-body and voice as if this were a new phenomenon. This knowledge has been around forever, and this pleasant missive is an attempt to repurpose old material as new. Probably best considered as a marketing effort. Always good to be reminded of some old truths though. 5.0 out of 5 starsThank goodness - a book that really makes changes. Resonate is the book that I've been waiting for - it is chockful of simple yet effective tools to make changes in the way I speak, stand, present, enter room a room, shake hands - everything to do with the way that other people perceive me. Dr Mahler, despite her impressive academic credentials, writes with great humour and in a very easy and accessible way. I've used these techniques both for work and in my personal life (I'm on several school committees) and I can feel the change - I'm getting my points across more effectively, people are taking my contributions more seriously, I'm being noticed! This book is a life-changer. 1.0 out of 5 starsmake up your own mind folks. I notice all the reviews are by people who aren't verified readers(except one). Big marketing con. Typical. As someone whose work is not unlike what Louise Mahler does, I wasn't sure I wished to read another book on public speaking or establishing connection. Well, the moment I started to dive into "Resonate," I was struck by the power of Ms. Mahler's message. Instead of skimming the surface of the essentials - voice, eye movement, posture, the body - this book digs deeper into these basics than any other book I have read. No wonder - Louise Mahler is a former opera singer who fully knows the mechanics of mind/body connection. If you want a fluffy read with quick fixes about public speaking, "Resonate" isn't the book for you. But if you wish to more fully explore the essentials you think you already know, this book could be transformative. I thought I had all of this information "down," but I sure learned a thing or two. Thank you, Louise Mahler! 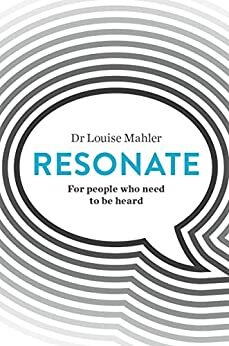 Having seen Dr Louise Mahler speak at several events, and now having read this, her first book, all I can say is that it's helped me continue to grow and develop my ability to speak and be heard when I'm called upon to present to groups in my industry (which is a non-negotiable part of my role, and something that scared me no-end in the past). I thoroughly recommend this book to people who need to communicate effectively in all areas of their lives. I have seen many of Louise's videos and seen her on TV and found her motivating and honest. This book didn't let me down! Great tips I will take away about my style and how I communicate. Easy to read and I highly recommend Resonate. There are so many better books on this topic. A good effort to try to offer up some interesting nonverbal and vocal tips,however it has all been done before. I highly recommend the work of Roger Love. Now here is someone who really knows his topic.Sorry...this dated book is a for a small local market.